Deeds have a value set on them. The more serious the bug you report, the better the bugreward. They are from 1-4 in value (4 is the highest). Value1: Gives you all robes and cloaks to choose from. Value2: Gives you all robes, cloaks and other clothing items to choose from. Value3: Gives you all robes, cloaks and other clothing items to choose from, furthermore you may also choose one of the statues. Value4: Gives you access to all items (the chairs as well). Using a bugreward deed and choosing an item causes the deed to destroy, even if you had a Value4 deed and used it to get a robe (Value1). Below is the image of all existing bugrewards. When a GM hands you a bugreward deed, you can use that deed to cash in one of them bugrewards. To explain the image a bit. The red “Number 1” and red “Number 15” are the robe/cloak number you can see in the gump. For instance, if you wanted the green color, you could choose “Robeofhonesty7”, “Robeofhonesty13” would give you that aqua blue one. All redlike colored Value2 (fine dress cloths) are named “Honesty”. 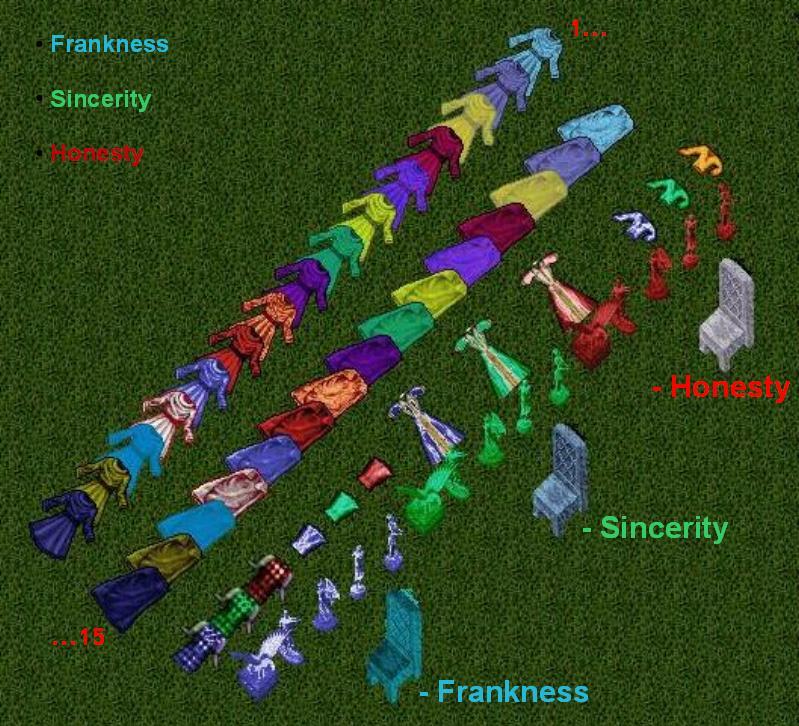 All greenish ones are named “Sincerity” and all bluelike ones are “Frankness”. The statues have 3 different colors and 5 different numbers. The uppermost bust has “1” on the ends of it’s name, the eagle statue has 5. As with the clothing items, “Honesty” is redlike, “Sincerity” is greenish and “Frankness” is bluelike. The chairs are named like on the image. 3 level 1 deeds can be traded for 1 level 2 deed, 3 level 2 deeds can be traded to 1 level 3 deeds etc. To trade these deeds you will need to contact a GM. Only deeds can be traded, not the rewards itself (robes cloaks etc). Deeds cannot be traded down, only up. So 1 level 3 deed can’t be converted to 9 level 1 deeds for example.